Explosives have been used in an attempt to separate a stricken cargo ship into two pieces off the east Devon coast. Cutting charges were detonated remotely at about 1410 BST on the MSC Napoli, which has been stranded off Branscombe since January. The deck plates have been separated by the explosion, and tugs positioned at the bow and stern will try to pull the boat apart at high tide. A further detonation operation may be carried out on Wednesday at 1500 BST. The cutting charges will be positioned to cut the vessel's longitudinal joists. It is hoped this will allow the part of the ship ahead of the accommodation block to be parted from the stern. Morgyn Davies, the chief salvage officer for the Ministry of Defence's Salvage Marine Operations, said the operation had been successful. "There were some uncertainties in terms of the load on the ship," he said. "The initial cut went well - the charges all went off and sheared what we wanted to be sheared. "It's given us access to the places we want to go for the next cut, which will be determined by the tide." Prior to the operation, a 1000m exclusion zone was placed around the Napoli and navigational warnings issued. The Maritime and Coastguard Agency (MCA) said experts will now inspect the ship and assess the situation. Devon and Cornwall Police have reopened footpaths to walkers, but these will be closed again for the detonation on Wednesday. The exclusion zone will remain in place until further notice. The National Trust said it was concerned that oil which has come off the vessel since the charges were detonated is heading towards shore. 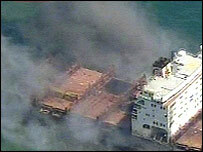 The MSC Napoli was deliberately grounded in January after it was damaged in storms. It was refloated last week but the results of a diving survey revealed the hull was severely damaged and it was beached again on Thursday. Contractors appointed by the ship's owners have been dealing with oil which has been coming ashore on some of the beaches along the World Heritage Jurassic coast. 1. Explosion carried out on ship to weaken deck above crack in hull. 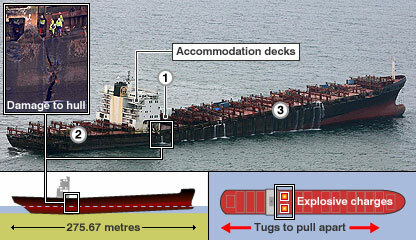 Tugs will try to pull the ship apart and if that fails a second explosion will be carried out. 2. The stern will be left where it is, as it is grounded on the seabed. 3. The bow of ship will be floated and towed away for salvage. Can ship-wrecked goods be kept?